The German shepherd is only just over 100 years old. 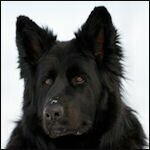 The breed was the deliberate product of a breeding program began by 'The Father of the German Shepherd', Rittmeister Max von Stephanitz. They first gained fame as a working dog in the German Army during WWI. However, German shepherds became truly famous with the introduction of Rin Tin Tin in the movies of the 1930s! That fame was well earned. These stalwart dogs became police dogs, guide dogs and movie stars who demonstrated their intelligence and loyalty. "The German Shepherd is among the most highly respected of all dogs." German Shepherd dogs, or GSDs (translated from the German, Deutscher Schäferhund) are highly intelligent, extremely loyal and protective, and very beautiful. A brilliant blend of gentility and assertiveness, these natives of Alsace are medium-sized (75-90lbs/34-41kg). The male German shepherd dog breed is about 24-26 inches (61-66cm) at the withers (the top of the shoulder bones), the female slightly smaller. This dog has a dual-tone coat - most commonly black and tan - and deep brown eyes, with perky ears and a square heads. German shepherds look great in motion or at a stay. There are several sub-breeds, even while still being considered purebreds. Pure white German Shepherds are in heavy demand, the result of both their native beauty and their even dispositions. There is also a longhaired version that looks like the name. The color is still very German Shepherd-like. However, the hair around the face and chest are much longer than the standard, slick look of the regular type. German shepherds are a regular at international dog shows, often winning top prizes easily after years of training. This outstanding dog breed has a lean, angular body. There eagerness to perform complements well their innate beauty and good manners. For reasons best known to experts, the white and longhaired German shepherds are considered 'faults'. Both breeds are often disallowed at shows. GSD'S are justly famous for their ability to act as guard and rescue dogs. They will bond with owner or trainer within a few months. They are strong enough to perform considerable work, but not overly aggressive by nature. The German shepherd dog breed has extraordinary scent detection abilities. This dog breed is widely used by police forces throughout the world. This dog enjoys training and is a delight to interact with. Yet, unlike other breeds such as Dalmatians or Retrievers, they do not require constant activity in order to be calm and happy. They can be equally happy just watching from the sidelines. They can be content to walk calmly along a border on patrol or just lie on a porch and await the next game. 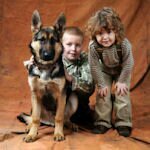 German shepherds are good with children and do not typically threaten the neighbors unless they have been trained to react when someone comes onto the property. They may growl or bark, since anyone not of 'their pack' is naturally considered suspect. 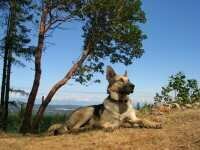 German Shepherds do have health conditions, which they are somewhat more prone to than other breeds. Bloat (GDV, Gastric Dilatation Volvulus) is possible and occurs when the stomach dilates as a result of an excess of fluid, and sometimes twists. Otitis Externa is an inflammation of the ear canal that frequently affects dogs with long ears, such as those of the German Shepherd. 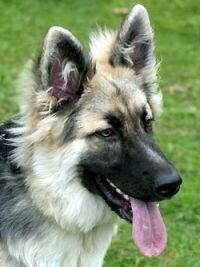 However, apart from diseases, GSDs are relatively easy to care for. Coat, nail and other aspects require only a small effort to keep them healthy and looking good. 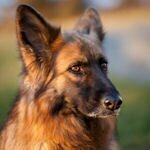 The German shepherd dog breed has a double-layered coat comprised of a short, thick, wiry overcoat and a soft, dense undercoat. The fur sheds somewhat in spring but requires only modest care. Bathing the water-resistant coat is required only occasionally, while regular brushing is enough to keep the skin and hair healthy. It is important to search for a German shepherd dog carefully for an individual that has a good genetic background. With the popularity of this dog breed, among the 10 highest in the USA, poor breeding programs have sometimes produced problematic dogs. Insist on good documentation relating to Hip Dysphasia and other problems and you can generally rest easy. Always seek out a reputable German Shepherd dog breeder.